Right now you can save $12 on the Surefire: G2X Tactical Lights, single or dual output! If you've been eyeing up this light, now's the time to grab it. The new G2 "X", has 200 blazing lumens! 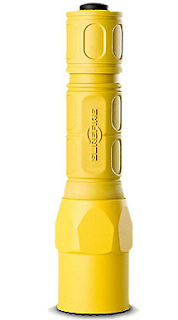 It's virtually indestructible, in a Nitrolon body which is sculpted for a more comfortable and secure grip. Available in yellow or black, to suit your preference! Improved performance—with SureFire’s proven dependability—at a more affordable price. The dual output has two different levels, high for maximum output, and low for extended run time. Check out this great sale on these great lights, today! you post a very good post about Lumens Coupon Codes . I am also providing Coupons.nice post. thats one great blog, I read !! I just came across another great Clothing Coupon Codes providing website to get discount on while shopping.